I disagree. We are the nation. If you build it they will come. I hope they win that “home game” in Mexico City. Courts would not allow that. Sorry man. It is a blog of opinions. Some of these people are full of themselves though. And the koolaide is flowing a little fast these days…. WTF, where did these new blog rules come from? Bless you boys, bless you! I went to lunch today with the grandchildren and thier families. I’m going to the ballgame between the Chiefs and Raiders in October next month. We’ll attend early services and have a short bible study both to and coming home fom the game. This is big news for my old heart. I hope you will share my joy. Keys to Sunday’s game. Offense: score points Defense: don’t allow points. Check out the size of those balls! I think we are the best road game showing fan base and if they build that stadium we will fill it every week. It will quickly become home. Oakland needs to get there head around that before it happens. They are playing a high stakes game and the fans will lose. someone finally dumb it down for you? I remember when we were 2nd in # of Lombardis, only the Steelers with 4. Now we are 7th, tied with 2 more teams. Isn’t that where the 9ers got all there fans anyway, when Al left the first time?? Courts? what courts? this is the NFL, they have their own rules… Especially when it comes to relocation. Yeah its time to catch up. The next 3-4 years we have to make another push. Raiders are coming to Tampa this year but there is something about watching the raiders in the peace and comfort of my own home.. 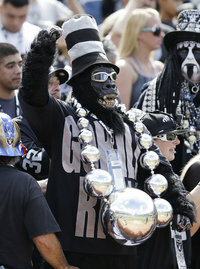 I think I want my first raiders game that I ever attend to be in Oakland with die hard raider fans. otherwise, i’ll just watch from home. Of course we do. You lucky man!!! Plenty of die-hards to be found no matter what stadium they’re in……….go to the game. No man is lost while yet he lives. Disagree brother. You should go wearing every bit of Silver and Black you can.